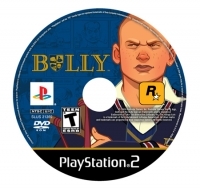 Box Text: Bully takes the Rockstar tradition of groundbreaking and original gameplay and humorous tongue-in-cheek storytelling to an entirely new setting: the schoolyard. 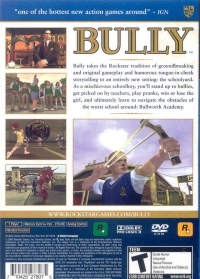 As a mischievous schoolboy, you'll stand up to bullies, get picked on by teachers, play pranks, win or lose the girl, and ultimately learn to navigate the obstacles of the worst school around: Bullworth Academy. 02-12-2013 stagecoachkid Box Text Bully takes the Rockstar tradition of groundbreaking and original gameplay and humorous tongue-in-cheek storytelling to an entirely new setting: the schoolyard. 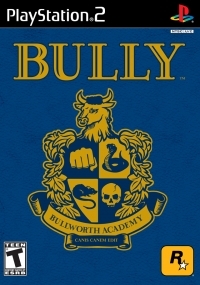 As a mischievous schoolboy, you'll stand up to bullies, get picked on by teachers, play pranks, win or lose the girl, and ultimately learn to navigate the obstacles of the worst school around: Bullworth Academy. This is a list of VGCollect users who have Bully in their Collection. This is a list of VGCollect users who have Bully in their Sell List. This is a list of VGCollect users who have Bully in their Wish List.